After Keyhole Bay’s top high school football player dies in a car crash, Glory suspects that Bluebeard is trying to tell her that it was no accident, and his squawk sounds very similar to her Uncle Louis who died decades ago. It seems like his ghost is haunting the souvenir shop and speaking to her through a bird! With the police convinced Kevin Stanley’s death was an accident, and his own fault at that, Glory decided to do a little investigating of her own. I enjoyed the mystery and finding out about the possible suspects. I did feel like there were holes in the plot, with one major element of the mystery that was never wrapped up. Because it was specifically about Kevin Stanley’s death, I don’t see how it would carry over to the next book, but maybe it does. For me, the characters in this book stole the show. Glory and her group of friends were realistic and likable. There’s Karen, Glory’s best friend and a reporter/radio personality at WBBY; Ernie and Felipe, the fun couple who owns the local antiques shop; and, of course, there’s the quirky parrot Bluebeard. We’re also introduced to Jake, the cute owner of Beach Books. He’s the new boy in town, but there’s already a romantic spark between him and Glory. 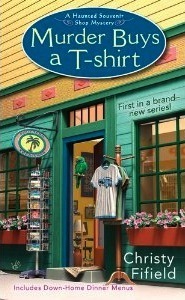 MURDER BUYS A T-SHIRT is a delightful cozy mystery, and I will definitely be reading more of the series. Yummy recipes of traditional Southern dishes are also included. This entry was posted in Cozy Mystery, Mystery, Paranormal Fiction, Reviews and tagged 4 Stars, Christy Fifield, Ghosts. Bookmark the permalink.